Welcome summoners, to the second edition of Tournament Realm!This time I’ll be bringing you a rundown of the teams competing at IEM San Jose over the weekend. As we enter December, the pre-season is kicking into high gear. Welcome summoners, to the second edition of Tournament Realm! This time I’ll be bringing you a rundown of the teams competing at IEM San Jose over the weekend. As we enter December, the pre-season is kicking into high gear. This past week has been dominated by discussion over the jungle in patch 4.20 — not to mention the inevitable Rek’sai buzz! Maybe some of you even watched the OGN preseason matches last night? It’s hard not to get excited — and now we actually have something to watch! IEM San Jose will be the first major tournament on the new patch, as well as on the new Summoner’s Rift. Not only does this mean we might get to see some Azir play at the pro level (but no Kalista, as she’ll be banned), but the outcome of the tournament will be that much harder to predict. The onus will be on the junglers to show they have adapted to 4.20’s many changes. Expect some Warwick bans, less priority on carry junglers like Kha’zix and Lee Sin, and maybe even some innovative picks? Diana hype — please be real. The matches will be single elimination Bo3, except for a Bo5 finals. They will be hosted by ESL’s stellar commentary line-up including — surprise, surprise! — former CLG.eu and EG jungler Snoopeh! Looking forward to seeing him at the analyst desk. After a solid showing at Worlds, TSM will be looking to start the 2015 pre-season on a strong foot. They’ve demonstrated they can play with the best, but it’s unsure what the future holds. Can TSM continue to improve, or will Cloud 9 regain the NA crown? All eyes will be on new jungler Santorin, putting him under immense pressure to adapt to the new patch and perform as part of TSM’s veteran line-up. Given his limited off-line experience, this tournament will be extremely telling for Santorin — and for TSM’s recruitment policy in general. Santorin has been reliant on carry junglers, like Lee Sin and Kha’zix, in the past. This could prove problematic on the new patch. Hopefully he will have some fresh picks prepared and can find strong mid-lane synergy with fellow Dane Bjergsen — a trademark of past TSM junglers. Even if Santorin under-performs, TSM should make it to the finals. If Santorin lives up to his reputation, they have a decent chance of winning the tournament. Although Alliance’s performance at Worlds left some concerned about their ability to deliver under pressure, this flop has also led to one of the most high-profile moves of the pre-season: Rekkles’ switch from Fnatic to Alliance. With the addition of Rekkles, Alliance can once again lay claim to the title of European super-team. But will this swap be enough to give them a win at San Jose? Key places to watch will be the bot lane — where Rekkles’ synergy with new lane-mate Nyph will be a deciding factor — and the jungle. Shook has played some unorthodox champions in the past (Rammus and Riven to cite a couple examples), and similarly creative picks could make the difference in this tournament. Despite a narrow loss to TSM in the Summer Split of the LCS, Cloud 9 should be happy with their performance in 2014. They did well at Worlds, made it out of a tough group and managed to take a game off Samsung Blue in the quarterfinals. Their fan base in North America was enough to see them qualify for IEM San Jose with 42% of the fan vote. Unfortunately, former group-mates Alliance now stand in Cloud 9’s way. If C9 want to make it to the finals of IEM San Jose, lock-in a place for Katowice, and exact revenge on TSM, they will have to thwart the plans of Froggen and company first. Given the 1-1 record between these teams, the match-up is difficult to call — although the addition of Rekkles could make a difference on Alliance’s side. Out of the three main contenders in this tournament, Cloud 9 is the only one without any roster changes. This could give them a slight edge. They have spent three full splits at the top of the LCS, so they are unlikely to be guilty of complacency. But there will need to be some serious innovation (from Meteos in particular) on patch 4.20. Hai’s crisp shot calling and C9’s signature team play will have to come to the fore as well, if they want to win against both Alliance and TSM. Unicorns of Love were voted into IEM San Jose with 49% of the EU fan vote, beating their nearest rivals (SK Gaming) by a margin of 10%. I think it’s safe to say that while UOL were once underrated, they aren’t anymore… UOL earned their EU LCS spot in somewhat unusual fashion. They were picked first in the Spring Promotion Tournament, by sixth-placed Millennium. It was a match Millennium should’ve won, if they’d done their homework. But, after going down 2-0, UOL pulled out some innovative picks and staged a dramatic comeback, managing to crush their opponents in a trio of extremely one-sided games. Although UOL’s wave of support may simply be due to their awesome name, as mentioned, the team also boasts an exciting champion pool. Top laner Vizicsacsi played Poppy (before MakNooN made it cool in North America) and went 8-0-7 in Game 3 against Millennium. Then in Game 5, mid laner PowerOfEvil busted out Cassiopeia and went 6-3-12 — just to show he was capable of carrying on off-meta champs. Both solo laners may draw bans as a result, with support Hylassing’s Thresh play looking equally dangerous (details). Despite their success thus far, Unicorns of Love are likely to be underrated by the bigger teams. If they can make it past their first opponents — Lyon Gaming — this could work to their advantage. They are also entering this tournament with a recent jungle change: swapping Gilius for Kikis just after LCS qualification. Kikis has had over a month to settle into the team and learn the new patch, so his addition shouldn’t pose a problem. Nevertheless, he’ll be one player — out of many! — to watch in San Jose. paiN Gaming were the subject of some hype coming into this tournament — not due to any exceptional play — simply because they had the dubious honour of beating Kabum! eSports in the qualifiers. For those of you “in the loop”, this means they are now the unofficial holders of the Belt (link for the interested). paiN’s qualification for IEM San Jose saw a good run of form, where they beat all opponents in clean 2-0 victories. I’m inclined to expect positive things from them at IEM San Jose, as a result of this. Unfortunately, paiN Gaming will be taking on Cloud 9 in the first round and that could prove challenging. Cloud 9 has recent experience against Brazilian teams and they don’t underestimate their opponents (unlike some other Western squads). paiN will need to bring their A-game if they want to beat C9 in a Bo3, but I’m looking forward to a decent match regardless. Lyon Gaming were the last team to qualify for IEM San Jose, winning the Riot Latin America Cup just a few weeks prior. They put in a good showing at this tournament, dropping one game in the semifinals, then going 3-0 against their Argentinean opponents Furious Gaming in the finals. Without insider knowledge of the Latin American scene, it’s hard to gauge the significance of these victories — but Lyon Gaming is certainly recognizable. Hailing from Mexico, Lyon Gaming have boasted a relatively stable line-up for the past few seasons. Unfortunately, their recent international appearances — at IEM Sao Paolo last January and at the International Wildcard Tournament in Season 3 — were fairly unsuccessful. They are certainly dominant within their own region, but they’ve been unable to translate this into success against international teams thus far. 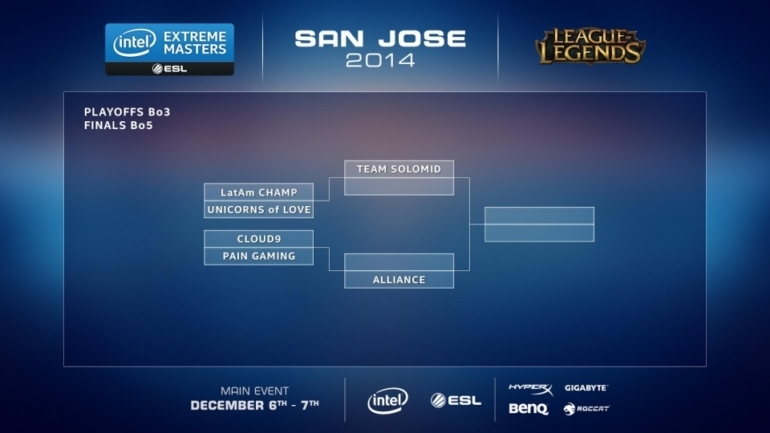 TL;DR – IEM San Jose is the first tournament on the new patch, new Rift. Watch for TSM’s new jungler, first taste of Alliance + Rekkles, C9 facing rivals old and new, UOL’s innovative picks. Check back next week for a preview of the double elimination round of the NA Expansion Tournament! And thanks for reading!